When a Curlew Sandpiper, a European species of shorebird I have never seen, was reported from Jamaica Bay last weekend I really wanted to go see it. I decided not to drop everything and go as I was planning on being in New York this weekend anyway, so I asked every birder I knew who was going to see it to try and talk the breeding-plumaged bird into staying until the weekend. I was very happy to see it reported on the listservs Friday and was in my car at 4:20 Saturday morning, heading down the familiar roads to New York City. I made great time until I foolishly decided to use the Triboro Bridge as my route into Queens. It turned out the usual four Queens-bound lanes had been reduced to two for construction. Instead of arriving at Jamaica Bay at seven I got there shortly after eight. And I wasn’t the only one. As I pulled into the lot along Cross Bay Boulevard I saw another group of four birders getting prepared for the walk into the East Pond and a fifth already on his way. I quickly grabbed my gear and replaced my sneakers with my new waders and trudged down the boulevard through the hot and sticky air. I turned off the boulevard at the gravel access road and mentally prepared myself for the arduous task ahead of me. You see, Jamaica Bay’s East Pond is surrounded by thick marsh vegetation. To see birds there one must walk through one of the narrow access trails, through the marsh grass, and out onto the mudflats exposed by the lowering of water levels. Needless to say, on a hot, humid summer day it is not the most pleasant of experiences. As I walked out onto the mudflats the stench of mud, rotting things, and general nastiness scorched my sinuses. I didn’t care though, as my brain was busy trying to wrap itself around hundreds, if not thousands, of shorebirds. Short-billed Dowitchers, Semipalmated and Least Sandpipers, Ruddy Turnstones, Greater and Lesser Yellowlegs, Killdeer, Semipalmated Plovers and other species were everywhere! Forsters and Common Terns, more readily identified now that Forsters Terns have shed their caps, hunted for food or stood on sandbars. The four common summer gull species in New York, Herring, Great Black-backed, Laughing and Ring-billed, were all present in a dizzying array of plumages. Great and Snowy Egrets sought their meals in shallow water alongside of the occasional Glossy Ibis. Also present, on a less muddy spot a couple of hundred yards south of the northwest corner of the pond, was a flock of birders, whom I approached to ask for news. Of course, they had already had the bird but it had flown to the south, followed by another birder. One look at the “trail” showed me why the entire group of birders had decided not to continue south. So what did I do? I walked through the mud, carefully curling my toes inside of my waders to make sure that when I lifted my feet the waders came with them, rather than staying stuck in the mud. As I walked I spotted Osprey, Song Sparrows, Red-winged Blackbirds, Boat-tailed Grackles and more shorebirds. 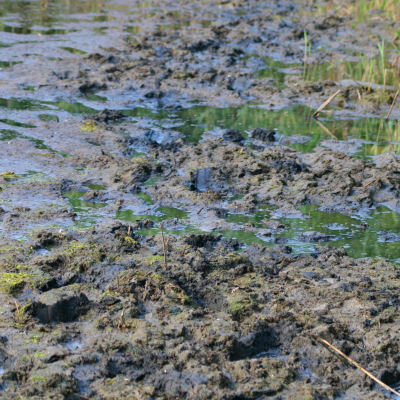 When I finally reached the lone birder that had headed south, I was glad for a pause in picking my through the squelching mud. We introduced ourselves and then Kevin and I scanned the shorebirds. And scanned them some more. And scanned them some more. Then his cell phone rang. Someone had spotted the bird and it was believed to be somewhere across the pond from us. Kevin got on the bird with his scope and allowed me a look. What a brilliant bird, with brick-red plumage in front and a slightly down-curved bill. A year-bird, and not only that, a lifer! Whoo-hoo! Then the bird took off and we were afraid of losing it, but Kevin expertly tracked it with his scope and, despite being aloft for about a minute, the Curlew Sandpiper was still in his sights when it landed. I called the group of birders that had arrived at the same time I had (it’s always good to exchange cell numbers with every birder you meet on a twitch, especially if you don’t know exactly where the bird is), and they came through the mud and also got on the bird. I departed, muddy, sweaty, and bug-bitten but happy. Jamaica Bay, while not an easy place to bird in the dead of summer, had paid off again. 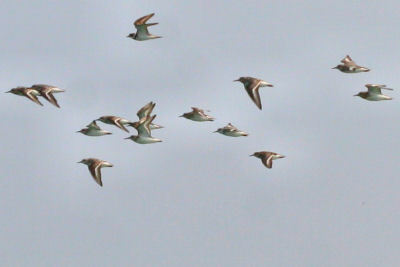 If you want to see what a Curlew Sandpiper looks like and learn a bit more about them, click here. As usual congrats on your bird… Next weekend, We clean up. Sweet! Congratulations! I should have gone to see that bird. I think I’ve travelled over the Verazanno enough for one month though.